In the parable from Luke that we read this Sunday the rich man is so absorbed in himself and his “good” life that he sees nothing else, not the poor man at his door nor his own inevitable death and judgment. Living in the bubble of the present, nothing else, no one else matters to him. Jesus often warns against this kind of blindness. The scriptures are filled with similar warnings too. Psalm 49 says “In his riches, man lacks wisdom; he is like the beasts that are destroyed” (Psalm 49). Having too much can make you lose perspective. It would be a mistake to see this parable directed only to the rich, however. That same psalm calls for “people both high and low, rich and poor alike” to listen. You don’t have to be rich to be like the rich man in the parable. People who don’t have much can also be small-minded and shortsighted and self-absorbed and blind to those around them. Not only the rich, but we all can be self-centered and locked in our own small worlds, in love with success and blind to the poor at our gate. The parable says that we’re destined for a life beyond this and how we live and how we help one another now is really what matters. We won’t be judged by how well we took care of ourselves, or the honors we have accumulated. We’ll be judged by how we reached out to one another, especially the poorest, the slowest, and those who seem to fail at life. The rich man in the parable suddenly became aware of this. He finds himself left out, with not a drop of water to quench his thirst. The tables are turned. Jesus’ parable reminds us that the kind of blindness the rich man has is very difficult to break down. “Send someone back from the dead to tell my brothers,” the rich man pleads. But even if someone comes back from the dead, they will not believe. No matter how often we hear them, the parables of Jesus have their surprises. Did you notice that the rich man has no name in the parable, yet the poor man does? His name is Lazarus. Probably in his lifetime, everyone knew the rich man’s name, as one of the rich and famous. Probably few knew the name of the beggar looking for scraps of food at the rich mans’s door. But God knew poor Lazarus’ name. He knew Lazarus on earth and beyond this life in heaven. Probably a good test: how many Lazarus’s do we know? and to see others as you see and love them. Like the blind man, we want to see. This entry was posted in Religion and tagged Jesus Christ, judgment, Lazarus, Passionists, the poor, the rich and famous on September 28, 2013 by vhoagland. As far as I remember there are three miracles in which Jesus raises someone from the dead. The most famous is the raising of Lazarus, his friend. His sisters, Mary and Martha, were also well known to him. Jesus stayed with them at Bethany, on the outskirts of Jerusalem. 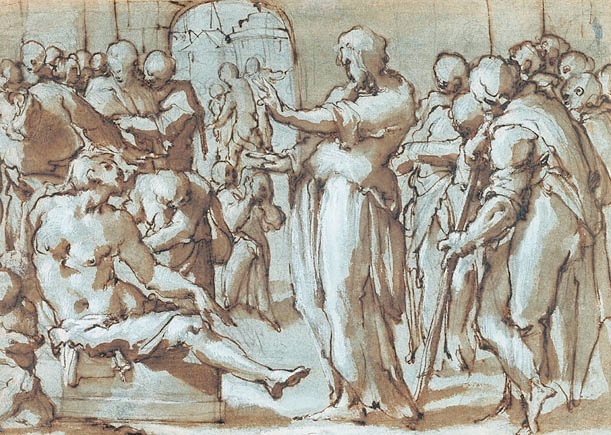 That miracle led his enemies to plot to put him to death. Earlier, in Capernaum, Jesus raised the little daughter of Jairus, an official of the synagogue, from the dead. The official pleaded with him. Jesus goes to his house, where the mourning had already begun, and took the little girl by the hand and raised her up and told her parents to give her something to eat. Today’s reading at Mass recalling the miracle in which Jesus raises the widow’s son as they carry him through the gates of the town of Naim seems somewhat different. The mother and son are strangers to him. We don’t know their names; they have no claim of friendship or position that may influence him. It’s the very opposite. The mother is a widow. Her son was the last asset she had and now he’s dead. She has nothing. Absolutely poor. “The poor have the gospel preached to them.” Those who have nothing and who know they have nothing, like the widow, are given the greatest gifts. God notices them. God’s heart goes out to them. That was an important teaching of St. Paul of the Cross, the founder of the Passionists. “Go to God in your nothingness,” he said to people looking for guidance. Learn from the poor widow. Go to God with nothing. In the years Paul of the Cross founded the Passionists, a lot of men left his community for one reason or another, and Paul respected them, but he reacted when someone left for the wrong reasons. St Vincent Strambi, his biographer, tells about a priest who left the Passionists to make a career for himself in the church. He wanted to be a success so he got a string of degrees and began to climb the church bureaucracy. He wrote Paul a very self-congratulatory letter informing him how much better he was now for leaving the Passionists. At the end he signed his name, noting all his new degrees and honors after it. Our first reading today is all about bishops and deacons. (1 Timothy 3,1-13) Our gospel is about a widow. Who’s more important? This entry was posted in Religion and tagged careerism, Jesus raising the dead, Passionists, Paul of the Cross, widow of Naim on September 17, 2013 by vhoagland. We call this Sunday “Catechetical Sunday,” because most parishes are beginning classes in religion this month and we’re asking God’s blessing on young people and teachers and all who are involved in religious formation programs. Passing on our faith to the next generation is one of the important challenges we face as a church. But is that enough? For one thing, the Second Vatican Council, which took place 50 years ago, gave some important new directions for growing in our faith. It told us to know God and love with our neighbor using the bible and the liturgy as guides. For example, there’s a longer and fuller answer to that catechism question “Who is God?” in the scriptures today. (Luke 15, 1-32) God is like a woman who doesn’t want to lose what belongs to her and keeps searching for a coin she has lost. God is like a shepherd searching for a lost sheep. God is a wonderful father whose son–representing the whole human race–finds himself far from home and the place where he should be. We are God’s children; we belong with him. God is the One who welcomes us, searches for us, waits for us, wishes the best for us, because we are his own. No catechism question and answer could describe God better than Jesus does in the story of the Prodigal Son and in his parables. The scriptures give us a way to know God that’s never exhausted. At the heart of scripture is Jesus Christ, God’s Word to us. He lives what he teaches. We know God through him, and with him and in him. The more we know him, the more we know the One who sent him. The more we know him, the more we know how to love our neighbor. The Second Vatican Council made clear in its Constitution on the Church in the Modern World, for example, that faith leads us to life in our world, however complex that world may be. The scribe in the gospel asks Jesus, “Who is my neighbor?” He doesn’t ask Jesus “Who is God?” Perhaps that’s because our relationship with our neighbor is more immediate and complex than our relationship with God. We can’t reduce loving our neighbor to a few things like lying, or cheating or killing one another. I was looking recently at the US Bishops’ site on the internet–a wonderful resource site about our faith, by the way– and noticed the many “neighbor” questions there. Questions like income inequality, immigration, housing, restorative justice, …They’re social questions, “neighbor” questions, dealing with a complex world that changes all the time. The Second Vatican Council also opened the window to new cooperation with others who do not have the faith we have and urged us to work together for a better world. Living our faith today is a challenging, life-long task. We’re all still in school. This entry was posted in Religion and tagged catechetical Sunday, Catechism, creed, Passionists, Prodigal Son, scripture on September 15, 2013 by vhoagland. Dorothy Day, pray for us! Some people think that religion is irrelevant when it comes to decisions about war or peace or economic matters. In fact, some say that religion should be kept out of any decision you make, big or small. But our readings for Mass today may indicate religion can say plenty about things big and small. or who can conceive what the LORD intends? and unsure are our plans. and the earthen shelter weighs down the mind that has many concerns. but when things are in heaven, who can search them out? and sent your holy spirit from on high? That’s a pretty pessimistic appraisal of how we humans grasp things. We’re not too good at getting things right, here on earth or about the things of heaven. We need a lot of divine help. Luke’s gospel today (Luke 14, 25-33) seems particularly relevant to our present situation. Jesus talks about building a house and going to war. to see if there is enough for its completion? Better think hard before going to war. There’s more to Jesus’ words than simple advice about having enough money for doing what you’re doing, or having a successful battle plan or exit strategy for war. We need to keep in mind the mystery of suffering. We also need to purify our ideas and motives. That’s why the pope called for a day of prayer and fasting last Saturday. We need to pray that God’s kingdom come, not ours; that God’s will be done, not ours. We can so easily get in the way of God’s plan, slow as we are to understand things. We need to fast too, but not from food. We need to fast from the automatic thinking we’re so used to as individuals and as a people. We need to get rid of violent thinking, violent actions, violent plans. Violence is so prevalent in our world today. We need to get rid of it, abstain from it, pray to God to exorcize it. 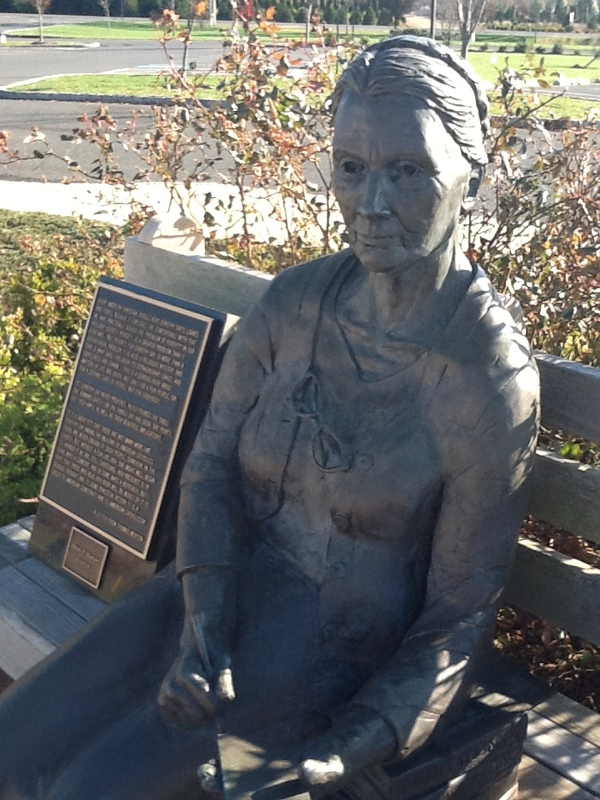 We have a wonderful statue of Dorothy Day sitting on a bench outside the church where I was today. I urged the people to take a look at her as they left Mass. She believed strongly in the principles of non-violence. She spoke out against war when it was unpopular to do it. She kept close to the poor and knew the mystery of suffering. If saints are an antidote to the poison of their time, she’s an antidote to the poison of our time. Dorothy Day, pray for us. This entry was posted in Religion on September 8, 2013 by vhoagland. Jesus and his opponents often clash over the Sabbath, as they do in today’s reading from Luke’s gospel. (Luke 6,1-5) Jesus’ disciples take some grain as they walk through the fields in Galilee. “Why are you doing what is unlawful on the Sabbath?” some Pharisees ask. All four gospels cite incidents like this. The question of the Sabbath was raised repeatedly in Jesus’ ministry. We may think the question is about a Jewish law, but it’s really about God. How would God act if someone was hungry, or thirsty, or in need? That’s not a bad question to ask ourselves as we look out into our world. What would God do for the people we see in need? How would God look at those who belong to a different race or culture or nationality than we do? How would God act towards those who harm others or live unjust lives? The Sabbath is God’s day, a day to remember who he is and what he has done. It’s not a day that restricts how we live, but a day that expands our vision to God’s vision. It’s a day to help us live other days of our lives. On the Sabbath, God gives us hope. No wonder Jesus spoke of himself as “Lord of the Sabbath,” for he reveals the God we want to know. Too bad so many think of him as someone who restricts the way we live. It’s just the opposite. He teaches how live and offers a hope beyond any we could conceive. This entry was posted in Religion and tagged Christian vision, Galilee, Gospel of Luke, Jesus Christ, Passionists, Sabbath on September 7, 2013 by vhoagland. September is a month for celebrating two places of pilgrimage in the Holy Land. We recall the dedication of the Church of the Holy Sepulcher in Jerusalem on September 14, the Feast of the Exaltation of the Holy Cross. On September 8th we celebrate the Feast of the Birth of Mary at the Church of St. Anne near the ancient pool of Bethesda, not far from the temple mount. Pilgrims to these ancient sites can face a dizzying array of archeology, history, art and devotion as guides hurry them through on their way to the next holy place. The two feasts can bring perspective to these important pilgrim places. They can remind those who have been to the Holy Land of what they experienced there and prepare those who may be going for what they may find there. Feasts and holy places are teachers of faith. We return to them again and again to learn what they teach. Like good teachers, they never run out of the wisdom of life. Besides these two pilgrim places, what others in the Holy Land should we remember? Certainly in Jerusalem there’s Gethsemani where Jesus prayed before his death, the Mount of Olives where he taught his disciples, Bethany where Lazarus was raised from the dead, Mount Zion where he ate with his disciples before he died. Beyond Jerusalem, there is Bethlehem where he was born, Nazareth where he was raised, Capernaum and the Lake of Galilee where he ministered, the Jordan River where he was baptized. I hope to offer some reflections on the two September feasts in the next few days. This entry was posted in Religion and tagged Holy Land Pilgrimage, Passionists, pilgrim places, pilgrimage on September 4, 2013 by vhoagland. The Year of Evangelization in the Catholic church is coming to a close this November. It’s a year dedicated to bringing the gospel of Jesus Christ to others through words and actions. We’re trying to get someone who has never been to church to come, and to get others who have left our church to come back. That’s not easy to do. It’s more than knowing how to say the right things to someone else. Evangelization needs a lot of time and a lot of hard patience. I was thinking about that as we remembered two saints last week in our church calendar ¬–St. Monica and St. Augustine. He’s one of the greatest intellects the world has every known; he has strongly influenced the way we think in our western world. Monica was his mother. In his Confessions Augustine tells God that God’s grace brought him to believe–so late, he admits. But in the Confessions, Augustine also acknowledges it was a mother’s tears and prayers that brought him to Jesus Christ. She was like the woman in the gospel who was bringing her dead son through the gates of the town of Naim to bury him when Jesus came upon them. Seeing her tears, he stopped the funeral procession and raised her son to life. You can see why the church celebrates her feast on August 27th, the day before her son’s, and why we read that story of the widow of Naim as the gospel for Mass that day. Like many women from that time, we don’t know much about Monica. She was married to a man named Patricius, a tough husband who put her down and went out with other women. They had three kids. She had a feeling that Augustine was someone special, and she followed him, trying in her own way to get him to be the person she knew he could be. She wanted him to have faith. It was a hard thing to do. He was so smart, so well educated, so hooked on the “lovely things” about him. He was deaf to her advice, blind to the path she wanted him to take, but she kept following him anyway. She was convinced God had something big for him to do, and she finally got her wish. She sounds like so many people today, loving their kids, or the husbands or their wives or their friends, but worried about them getting mixed up in the wrong things. They’re not going to church, they not listening to the gospel. But they stick by them anyway. This entry was posted in Religion and tagged Augustine, Confessions, evangelization, Monica, Passionists on September 1, 2013 by vhoagland.